Center location of the kaleidoscope mirrors, in screen coordinates relative to the center of the frame. Slices: Default: 6, Range: 0.01 or greater. Sets how many slices the image will be broken up into. Each slice corresponds to the area between the mirrors in a traditional kaleidoscope. Turn this up to get a more abstract look, and down to get fewer, wider slices. Fractional numbers here will get you one fractional slice; for a fully symmetrical look, use integers (3, 4, 5, and so on). Rotates the whole pattern about the Center by this many degrees. Rotate Kaleido: Default: 0, Range: any. Rotates the kaleidoscope itself, without rotating the image under (or inside) it. Rotate Inside: Default: 0, Range: any. 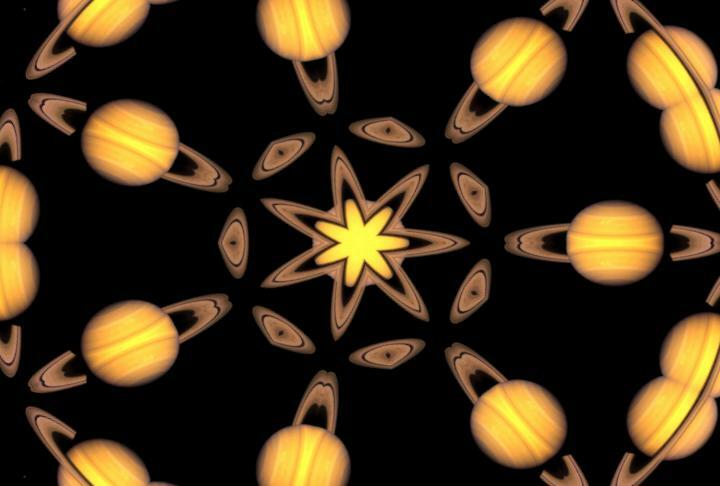 Rotates the image under the kaleidoscope about the Center, much like rotating the object box at the end of a traditional kaleidoscope. Rotate Inside Speed: Default: 30, Range: any. Auto-rotates the image under the kaleidoscope over time. This allows you to get a nice animated look even on a still background, much like a traditional kaleidoscope where you could rotate the object box at the end. In degrees per second. Shift Inside: X & Y, Default: screen center. Translates or shifts the source image inside the kaleidoscope before it is reflected.